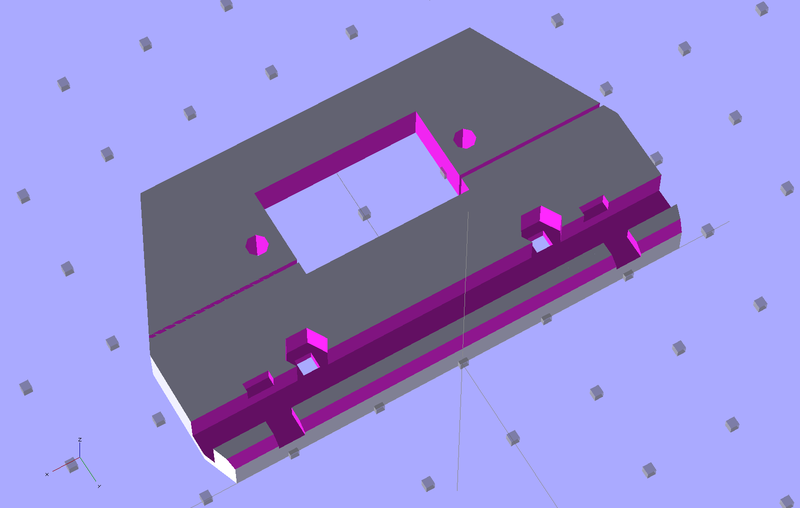 That mechanism may be cheap, straightforward, and easy to build in mass production, but I can’t figure out how to duplicate it for a case to house the GPS+Voice interface circuitry. That box had the dual disadvantages of being plug-ugly and not locking to the radio, but it did help establish some key dimensions, which is not to be sniffed at. 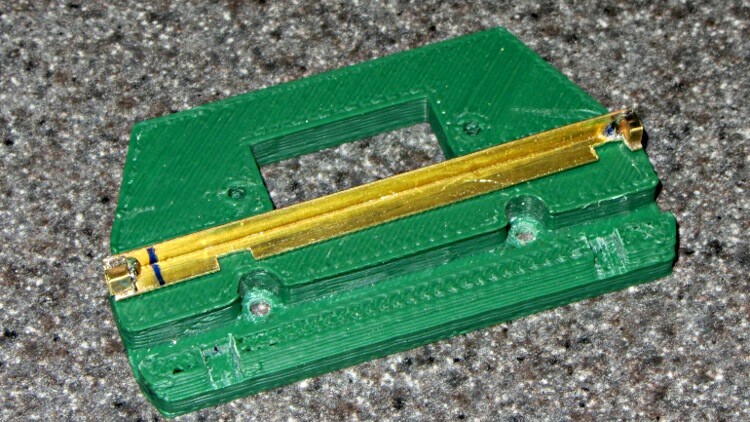 The rectangle on the top is a built-in support structure for what will be a window over the four LEDs on the Byonics TinyTrak3+ board. 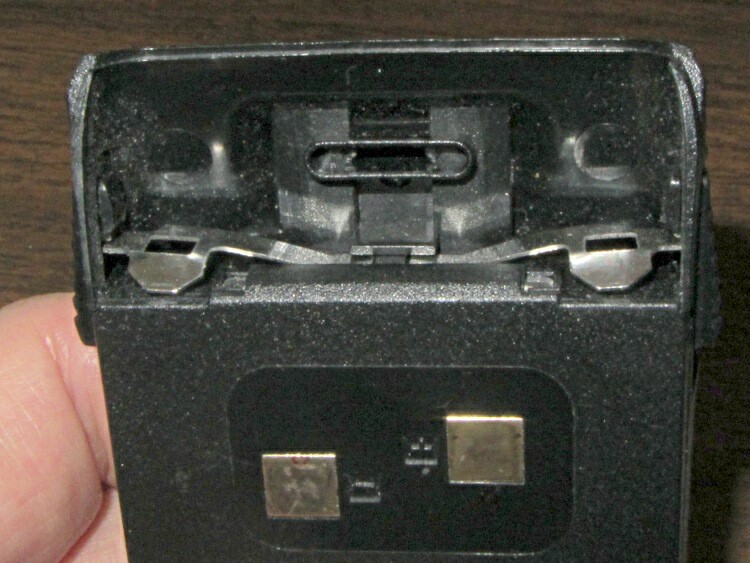 The two holes on the top allow screwdriver access to the TT3 trimpots, although they might not be necessary. 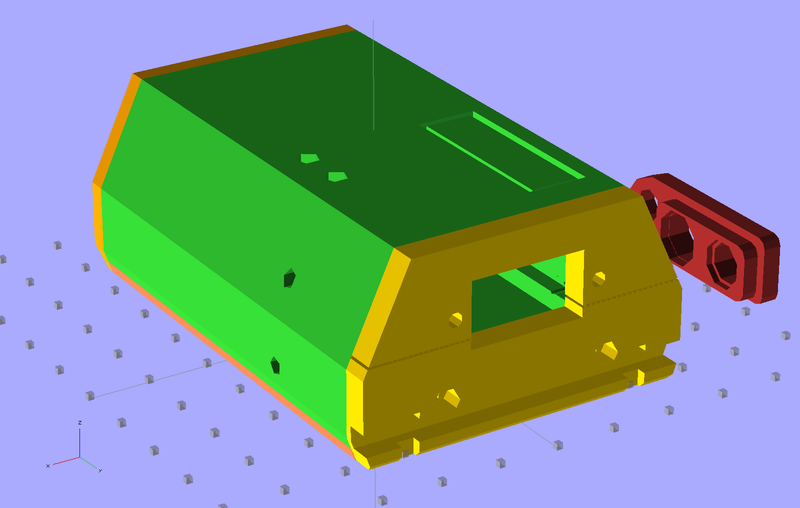 The four holes (two visible) along the sides fit 4-40 setscrews that lock the PCBs into slots along the inside of the main case body. The red doodad off to the far side is that plug alignment block for the radio. 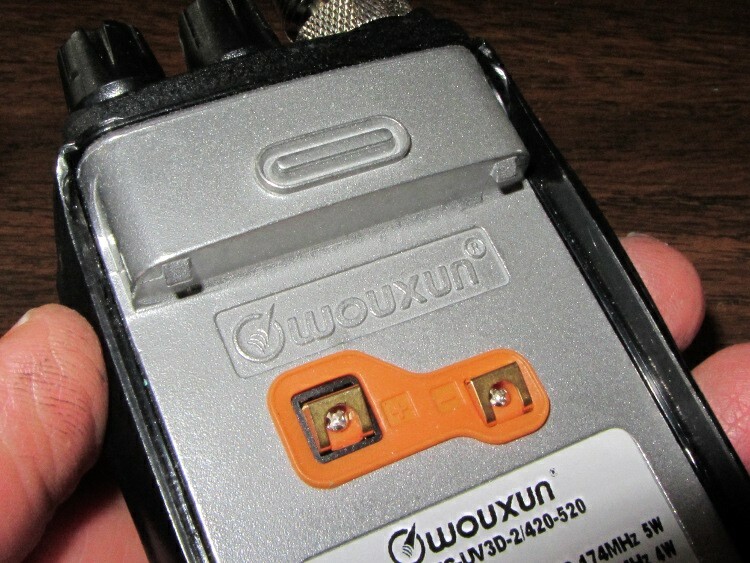 The big hole fits around the TinyTrak3+ serial connector to the GPS receiver. 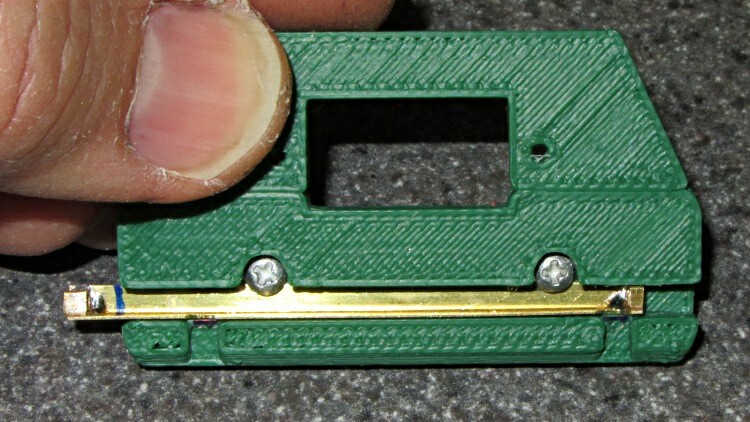 The slot across the hole splits the plate so it can fit around the already-soldered connector. I cut the angle to length with a Dremel abrasive wheel, soldered two brass tubes, sliced them off with a Dremel cutoff saw, roughed out the slots with the abrasive wheel, and applied some tool-and-die maker’s (aka needle) files to smooth things out. Yup, had to clamp each soldered joint in a toolmaker’s vise to keep from melting it during the nastier parts of that process. 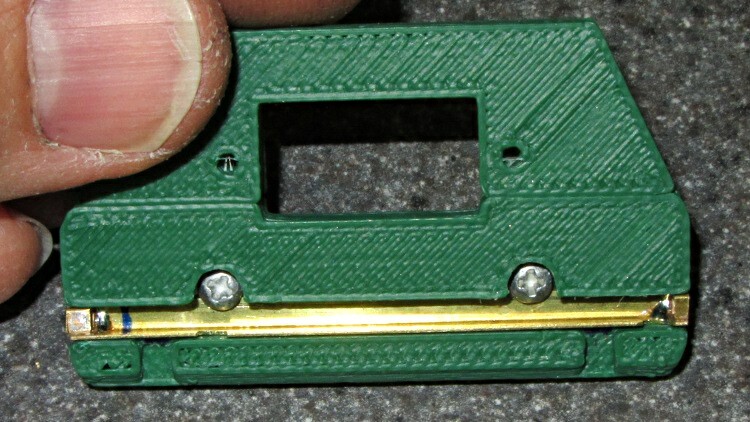 A pair of 2-56 screws, with nuts behind the plate, hold the bar in place and provide some friction. Moving the latch bar requires poking the end with a sharp object (captured by the brass tubing), because I couldn’t figure out how to put finger-friendly buttons on it. This would be completely unusable for an actual battery, but should work OK for a permanently mounted GPS interface.